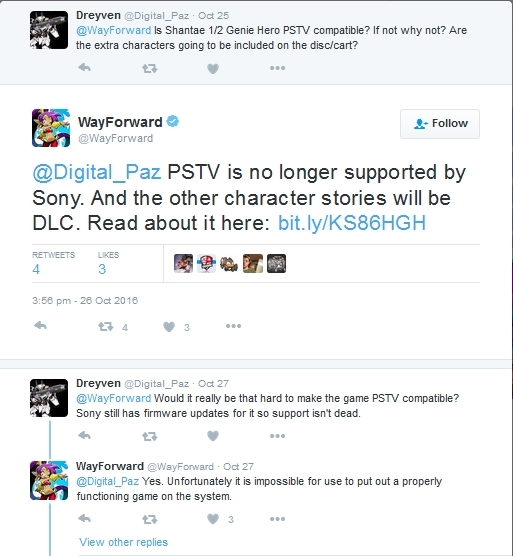 WayForward has stated in a since-deleted Tweet that the upcoming Shantae Half-Genie Hero wouldn’t receive PlayStation TV compatibility. They cited the device not being supported by Sony as the reason, which was called out and they said that it was impossible for them to release a functioning game on the device. It’s a shame more details weren’t given, because a quick to play game like Shantae would be a great fit for the PSTV. Sure, it has a very small userbase – but the nature of a platformer is great for a grab and go TV device. Unfortunately, while this news is a bit disappointing, it does make a lot of sense. They have already committed to releasing the game on the Vita and given how even that is a niche device at this point, it’s hard to expect them to want to release it on an even more niche device. Even the OUYA gets more new content on it than the Vita, and the PlayStation TV has been discontinued even longer than the Vita. Hopefully, those who want to play the game on the PSTV and don’t mind voiding their warranty will be able to do so with a whitelist hack down the line. Until then, playing it on the PS4, Xbox One, and Vita will have to suffice. Given the high quality of the series up to this point, there’s no reason to believe this will be anything less than an excellent side-scrolling platformer. Thanks to NeoGAF user oldmario for preserving the tweet in image form.